After continuing our journey with John Crichton last week with “Liars, Guns, and Money,” Parts II and III, our Farscape re-watch continues this week with the season finale of Season 2. Farscape‘s second season comes to a brutal, blistering, breathtaking climax with “Die Me, Dicohtomy,” which I have always considered the gold-standard season finale to which I inevitably compare all other season finales of all other shows, most of which come up lacking. It is the episode in which Farscape truly graduated from space opera to opera, full-stop, and not just in the sense of its literal use of an opera score (Agnus Dei, a classical requiem) in Aeryn’s gorgeous, heartbreaking funeral sequence but in the emotions, which are as epic, broad, and grand as those found on the stage of the Met but also completely grounded in emotional reality. There is nothing camp, arch, nor tongue-in-cheek about the emotions in this episode. In fact, they’re so powerful that, even on an umpteenth viewing, and knowing what happens in the next episode, they still hit me like a ton of bricks every single time, because it is all so devastating, honest, and rooted in these characters, who we have come to know and love over the course of the preceding two seasons. John accidentally killing the woman he loves due to being driven mad by an enemy–this is classic tragedy on the grandest scale, redolent with echoes of Othello, Hamlet, Pagliacci, Rigoletto, all of whom lose people they love either partially or fully by their own hands, whether intended or not. And the final moments of the episode bring the tragedy to a level of flawlessly calibrated agony and ecstasy that I don’t believe I’ve seen anywhere outside of opera. It’s almost a shame that the next episode is so readily available to watch the instant that this one is over now, because it is a genuinely magnificent cliffhanger that deserves time to breathe before being resolved. I remember the first time I saw it when it originally aired, being dazzled by its bravery and seemingly no-holds-barred, burn-the-show-to-the-ground grandeur, feeling simultaneously agonized by the idea of the torturous wait and also not wanting to know what happened next quite yet. It’s just all so perfect. In many ways, it is a remarkably cruel episode, putting these characters through the wringer as never before, and worst of all, not by the hands of an external enemy as usually happens in this type of story but by the hands of its hero, who has been stripped of his very identity from within. And the cruelest thing of all might be that, since the Scorpius within John’s head knows everything that John knows, he also knows how to inflict maximum damage, both emotionally and physically speaking on John and his friends. The first case is, of course, in the neural cluster, when John and Aeryn for the first time finally both vocalize their feelings for one another, entirely directly. John tells her he loves her and she actually responds, “I love you, too.” This is the most emotionally naked and fully “human” that Aeryn has ever been with anyone. As episode writer, David Kemper, says in the DVD commentary, not only is this the first time she’s ever said this to Crichton but the first time she’s ever said it to anyone in her entire life. This is one of the most important moments in her entire existence and one which the series has been building to for 44 episodes of television…and, due to the brilliant dramatic irony of having allowed the audience to see Ben Browder done up in Scorpius make-up at the start of the scene in order to establish that Harvey is in the driver’s seat, we know that she is being betrayed even as she says these words. Harvey makes a mockery of her feelings, knocking her out, and then slowly, foully licking her unconscious face, a horrendous violation on multiple levels–on Aeryn’s feelings, on her body, and on Crichton, who isn’t only helpless to stop it, but, as we later find out, doesn’t even know it’s happened. And later, Harvey plays a similar trick on Zhaan, expertly manipulating her into sharing unity with John by saying exactly what he knows would appeal to her sense of love for him, as well as kindness, and then assaulting her mind with his evil. It’s such a personal attack, because in both cases, he’s fully aware of how much John means to them and also how horrified he would be, were he to have known. And none of this, of course, compares to what happens above the planet where Crichton’s friends are hoping to have a highly skilled Diagnosan finally remove the chip from his brain once and for all. After having fully hijacked Crichton’s body, Harvey makes off in John’s module and sends a long-range signal to the real Scorpius so that he can find and retrieve him, and Aeryn, knowing that John would rather die than be taken alive by Scorpy, gets into her own Prowler and threatens to shoot him down, which sets off a breathless chase sequence between the two characters in their ships, Harvey taunting Aeryn even while using John’s piloting skills against her. What’s interesting is, although Aeryn would be the superior pilot in the superior craft under normal circumstances, as Harvey points out, Aeryn was trained to fly in space, and unlike Crichton, isn’t used to flying against gravity and atmosphere, which allows him to outmaneuver her, and then, in a shocking move, open up the module’s wheels and land them on top of Aeryn’s Prowler in mid-air, plunging them into her ship and tearing it apart. In an attempt to survive, Aeryn is forced to jettison her seat, planning on landing on the snowy ground beneath her, to which Harvey amusedly reveals that that isn’t solid ground but a frozen-over lake, at which point he maliciously restores John’s mind. Crichton is therefore jarred back into his own body, so to speak, when it is too late to help Aeryn. Browder and Black are both enormous in this scene, Browder having had to switch on a dime between the malevolent Harvey and the horrified, helpless John who is watching and listening to the woman he loves plummet to her death. And although on any other show (I know I say this phrase a lot), Aeryn would have been able to find a way to get out of the falling chair at the last moment, Farscape does not set up the idea of Aeryn’s strap being broken merely to increase the tension before she finally escapes. No, that strap is irredeemably stuck, and ever the pragmatist, Aeryn realizes that it’s too late for her. She is going to crash-land into that frozen water. And right before she dies, she tells Crichton, tears in her eyes, “I hope you meant what you said in the neural cluster. I did.” Again, it’s a moment of horrible cruelty. Although John has no memory of what he said, Aeryn’s tell him all he needs to know. He loves her, and she loves him, and he hears these words that he’s waited so long to hear from her when it’s too late to do anything about it because he’s murdered her. And while Tocot, the Diagnosan, tries to reassure him that he wasn’t he one who actually did it, those words are even less successful at convincing him than when Chiana told him in “A Bug’s Life” that it was the virus that had killed the PK scientist and not him. Because he loved Aeryn beyond reason and, from his perspective, that should have been enough for him to summon the strength of will to beat the Scorpius within him. True love is supposed to conquer all, and the fact that it didn’t is a failure on his part. Whether or not he meant it, Aeryn died because of him, and that’s a pain too deep to process. Aeryn’s funeral is one of the greatest sequences in all of Farscape, from writing, acting, directing, scoring, and cinematographic perspectives. Kemper explains that the reason he asked for director Rowan Woods to take such time with it was in order to sell to the audience that this was a real death that at the very least was not going to be undone within the confines of this season. Had the scene been any shorter or had it felt cursory in any way, people never would’ve believed the possibility that it was permanent. And, in retrospect, the fact that they take it so seriously is the reason that, even on a rewatch, it retains its power. These characters are all heartbroken by the loss: Zhaan, D’Argo, Chiana, Rygel, John. And each reacts to it in a completely honest way. Of course, for Rygel, the fact that he places one of the few pieces that he chose to keep from the riches that they stole from the Shadow Depository is huge. Knowing how greedy he is and how often in the past he jumped on any chance of getting his compatriots’ possessions should they have died, the fact that when Aeryn actually does die, he instead leaves something valuable with her speaks a thousand words. And D’Argo’s gesture is even more meaningful, for he actually goes so far as to place his Qualta Blade–his most valued possession, a symbol of his heritage and history–in her hands, in order to bury it with her. That is how profoundly her friendship has touched him. There are no words to adequately describe the power of that moment. The entire sequence is ravishing to behold. The icy, wintry environment surrounding them adds a perfect, beautiful, and beautifully desolate canvas to depict their agony, and the haunting requiem enhances the tragedy of the scene. The way Aeryn lies there in her coffin, looking both like a sleeping fairy tale princess as well as horribly dead at the same time, calls to mind images that range from Ophelia–who similarly drowned due to the indirect actions of her lover–to the Lady of Shalott, the Arthurian motif reflected both in the sword placed in her hands, the barge-shaped coffin, and Crichton’s very old-fashioned, knightly action of cutting a small lock of his lady’s hair to keep. Browder allows many different possibilities to play at once in this moment–a dangerous edge, as his friends initially worry whether he might either inflict harm upon himself or whether Harvey may again take control while he’s holding the weapon, and then absolute, utter devastation. And as Browder explains in the commentary, this scene is also a subtle pay-off to a recurring motif of Crichton paying attention to Aeryn’s hair throughout the season, gently touching it in intimate moments with her, and sensually smelling it the time that Aeryn scented it in “Look at the Princess”. To look at the corpse of the woman he loves and to know that he caused her demise is too much to bear. This horror is also what ironically allows him to take over control of his mind all together. In killing Aeryn, Harvey crossed a point-of-no-return line that John cannot accept, causing him to refuse to be taken over again. 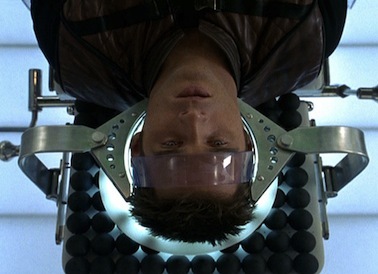 It’s also possible that, having inflicted this cruelty and knowing that Scorpy is nearby, Harvey no longer has a need to be controlling John at this point, but either way, for the episode’s final act, Crichton is finally, horribly aware of everything, and it is in this state that he submits to the brain surgery. There is a large chance he won’t survive, but given what happened to Aeryn, that’s probably fine with him. He would rather be dead than live with the chip in his head. Because the chip is embedded so deeply and has actually woven itself around his brain, the Diagnosan can’t remove it without taking some of John’s memories, which means that Crichton has to consciously decide which he wants to keep and which he can lose. He has no problem with Tocot taking his memories of American politics away, but significantly, he’d prefer to keep those of all of his dogs. And Kemper and Woods make a beautiful decision to, in the moment, not reveal whether or not he wants to preserve his memories of Aeryn. While we can guess (and we’d be correct at that) that he keeps these, it makes sense at the time that he might be tempted to get rid of them in order to avoid the pain. The ambiguity reminds me of the film, Eternal Sunshine of the Spotless Mind, in which people opt to have memories that will cause them emotional turmoil removed but in the process forget crucial aspects of themselves, often dooming them to repeat past mistakes without realizing it. John understands that so much of who he is today is because of Aeryn, and that is of course why he keeps her in his mind and heart, but the temptation to cut off the agony that remembering her might bring him would be understandable. An episode full of grandly operatic moments ends with the grandest and most operatic of all, when just at the point when Tocot has removed the chip but has not yet restored Crichton’s brain–the chip had been located right near the language center, leaving John currently incapable of speech–Scorpius saunters in, attacking and seemingly killing the weak doctor (who we learn had the been the one who had performed the surgery on Scorpy to insert the coolant rod system in his head, which is another link between Crichton and him, that the same doctor had operated on both of their heads) before he can heal John. Scorpius then looms over John, triumphantly holding the chip, and says, “Well, Crichton…So much to say. And yet, such little capacity. I only hope the wormhole technology I’ve waited so patiently for makes more sense…You’ve cost me much. And I do not suffer disappointment well. I condemn you, John Crichton…to live! So that your thirst for unfulfilled revenge will consume you. Goodbye,” leaving John to scream in wordless rage. Rarely do things ever get more dramatic than this…anywhere really. It’s a remarkable cliffhanger for numerous reasons. Firstly, there really seems to be no way out of it. Scorpy seems to have killed the only person anywhere near (if anywhere at all) capable of curing Crichton, John seems to have been forever robbed of his very voice and has lost the woman he loves due to Scorpius’ meddling with his brain, and the villain has exactly what he’s wanted since he first sat Crichton down in his Aurora Chair, even the fact that John is once again strapped to a chair while Scorpy gloats seeming to reinforce the circularity of the situation. Interestingly, though, Scorpius’ desire for revenge against John shows that Crichton did indeed get to him. Scorpius has everything he needs with the chip (or so he thinks, as the irony is that he will need Crichton to help interpret the data, after all, and had he killed Crichton here or previously when he had him captured, he would’ve been frelled), meaning there was no need to damage Crichton in this way. But this is pure spite, for the trouble John gave him; for destroying his Gammak Base; maybe even for the Shadow Depository. Scorpius doesn’t take humiliation lightly. His punishment for John is also reminiscent of Wesley’s words to the evil Prince Humperdinck in the final moments of The Princess Bride, when he tells him that he won’t fight him “to the death” but “to the pain,” that he plans on cutting off every piece of his face except for his ears “so that every shriek of every child at seeing your hideousness will be yours to cherish…[and] echo in your perfect ears. That is what ‘to the pain means’. It means I leave you in anguish, wallowing in freakish misery forever.” Farscape had echoed this scene before, when Aeryn had strapped Crais to the Aurora Chair to make him relive his life (the Chair itself seems a reference to the “Machine” from that film/book). Only, here, the situation is flipped, as it is the hero who has been victimized, utterly destroyed by the villain to a degree that basically never happens in sci-fi, the villain emerging triumphant and gloating. And that is how the season ends. Boom. –According to Kemper, Black, and Browder in the commentary, when production first started on this episode, they had put Browder in full Scorpy make-up, including teeth in order to indicate when Harvey had taken him over, except they realized that with all of the details perfectly, he actually looked so much like the real Scorpius, he was practically indistinguishable, which was visually confusing, and so instead they scaled back on the accuracy and did more of a broad approximation of Scorpius’ features, laid over Crichton’s. In addition to being easier to follow this way, it also makes for much more effective visual symbolism. It’s much more disturbing to see John’s recognizable face distorted into Scorpius’ visage than had it simply been Scorpius. –I’ve spoken before about how John is really the connective tissue that brought Moya’s crew together as a family, and Aeryn confirms that here when she tells him that he brought hope to the ship. In fact, she even seems to imply that it is a human word that they didn’t know before he arrived, which is a deeply resonant symbolic concept. This is why it is such a punch to the gut to realize that, in this episode, he ends up being the one who nearly snuffs out their hope, killing Aeryn, the very person who is telling him this, and in the end, he seems to lose the last remnants of his hope all together. Dark, dark, dark. –The episode also continues a tradition that I believe occurs in every season finale of Farscape in which everyone aboard Moya ends the season nearly splitting up and going in their separate directions, this time inspired by Aeryn’s death and the great likelihood that Crichton won’t survive the surgery, either. –After hinting at romantic yearnings between Zhaan and Stark in previous episodes, this is the first one that definitively establishes their relationship, with him asking her to share her future with him, both aboard Moya. While the others consider leaving, she considers it her destiny to stay there, ever since Kaheynu put Moya and Pilot in her care. In retrospect, this scene is also desperately sad, knowing Zhaan’s fate over the course of the next four episodes. –Another thing that going to the Diagnosan accomplishes is to finally begin to cure Moya of the intense burns she still has over so much of her body, ever since “With Friends Like These…” which is important. Visually, the charred set pieces are a brilliant visual parallel to John’s damage, as well as persistent reminder of the consequences of their actions in the “Liars, Guns, and Money” trilogy, but of course, a device was needed to ultimately heal her, and that it comes from the same source meant to heal Crichton is excellent writing. –In an otherwise very dark episode, most of the comedy here emerges from Tocot’s skeevy associate, Grunchlk, and the fact that no one can correctly pronounce his name, a great gag on the one hand, given that it’s usually Crichton who can’t pronounce alien words, meaning that his is particularly difficult, but on the other perhaps also a comment on how off they all are due to what is happening to Crichton. There is also some fun drug humor in the form of Stark, D’Argo, and eventually Pilot all getting a contact high from the numbing agent they’re using on Moya before the Diagnosan can work on her. –The episode also continues the thread of conflict growing between D’Argo and Jothee. As much as he loves his son, he has a great deal of trouble connecting with him, and it hurts him deeply when he finally realizes the real reason for his mutilations. He had done them to himself, hating his Luxan side due to the heartache it had caused in his life. At the same time, D’Argo wants to make everything better by finding a planet and settling down on a tiny farm with Jothee and Chiana, hoping that that way they can all find each other again, which is a sweet notion but untenable as it doesn’t suit Chiana or Jothee’s personalities. In trying to rush the situation, D’Argo’s actually doing exactly what Zhaan had advised against at the end of “Thank God It’s Friday…Again,” which is to try to force this dream of a simple farm family life into occurring, rather than allowing it to happen naturally. On the one hand, when Chiana and Jothee nearly kiss, it is a horrendous betrayal of D’Argo–and, of course, it only gets worse–while on the other, due to their youth, Chiana’s heartbreak at Aeryn’s death, and their confusion over how they both feel regarding D’Argo’s proposal (or at least what they’ve overheard of a vid recording of him practicing it), their behavior is understandable from a psychological perspective. It’s awful but it makes sense. –This is also the episode that 100% confirms Crais’ feelings for Aeryn. Before, it was a distinct possibility, but it was also difficult to tell for sure, given how he screwed over the others in regards to Talyn. Now, however, he actually has returned with important information he wants to share with Aeryn–which we learn next season is about her mother–as well as his own proposal, for her to be his second-in-command aboard Talyn. At the time, it doesn’t seem that Crichton will be likely to survive the surgery. And his scream of anguish when she’s shot down is completely genuine. Interestingly, Kemper said that this episode was also the point that he realized Crais would have to die at some point in the future, due to his position in the love triangle. Great analysis! I still get emotional just reading about this episode. One of the best of any television show! Every time I watch this episode the horror inflicted on John by Scorpius/Harvey is made deeper. Your analysis was extremely thorough and wonderful. This episode is why I love Farscape. Ben’s acting in this ep was magnifiscent. He had to be Harvey and he was scary and perfect in the role and then to flip on a dime (as you said) and be John totally lost. It deserved an Emmy.